Dinosaurs. What springs to mind when they’re mentioned? Colossal, towering sauropods? Packs of feisty feathered fiends? Or huge herds of hadrosaurs, chomping their way across the plains of long-lost worlds? Most, including myself, will automatically default to any one of these images when dinosaurs come up in conversation (what, you mean it’s not that frequent for normal people?) But we often neglect to think the earliest dinosaurs, spectacular organisms that gave birth to the most successful, and on-going, terrestrial vertebrate radiation of all time. Dinosaurs arose about 232-225 million years ago (mya), during the Carnian-lowermost Norian stage of the Triassic, the first period of the Mesozoic era. Their remains are known from a latitudinal belt, at about 40-50 degrees South, in Argentina, Brazil, India, and Zimbabwe. The fossil record of these earliest dinosaurs is quite varied. In Argentina, many near-complete skeletons of species such as Eoraptor, Herrerasaurus, Eodromaeus, are known, and in Brazil, Saturnalia and Pampadromaeus are the two best known examples. The formations that these are from have been intensively sampled (hacked apart for fossils), as opposed to others, which is a contributing factor to how much we know, relatively, about their biological bounties. Slightly younger beds are becoming increasingly well-sampled, especially around Europe, Argentina, the USA, and South Africa. These formations yield precursors to the well-known major sub-groups of dinosaurs, namely the basal sauropodomorphs and basal neotheropods. This shows us that the major divisions within dinosaurs were already recognisably established by the mid-late Norian of the Triassic (about 215 mya). 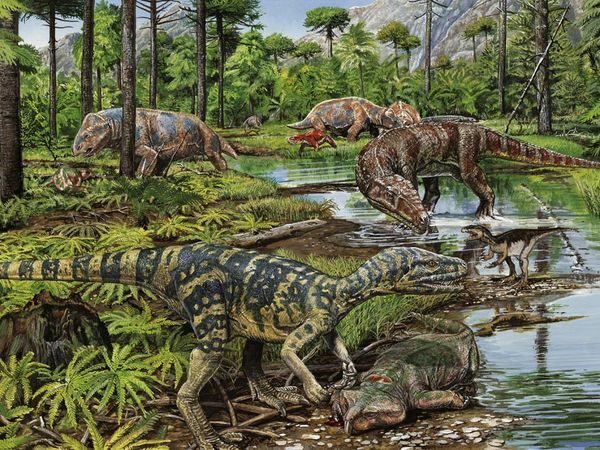 How these dinosaurs changed on a large scale is of great interest to palaeontologists presently, as what could be more intriguing that understanding how dinosaurs came to be such a successful group? The study of these broad scale patterns, including speciation, extinction, and the extrinsic environmental and intrinsic biological parameters that contribute to these patterns is called ‘macroevolution’. For palaeontologists, this is becoming a really cool subject to get stuck into, as it allows us to see how certain groups of organisms respond to things such as climate change, and therefore is quite applicable to modern day and near-future issues. 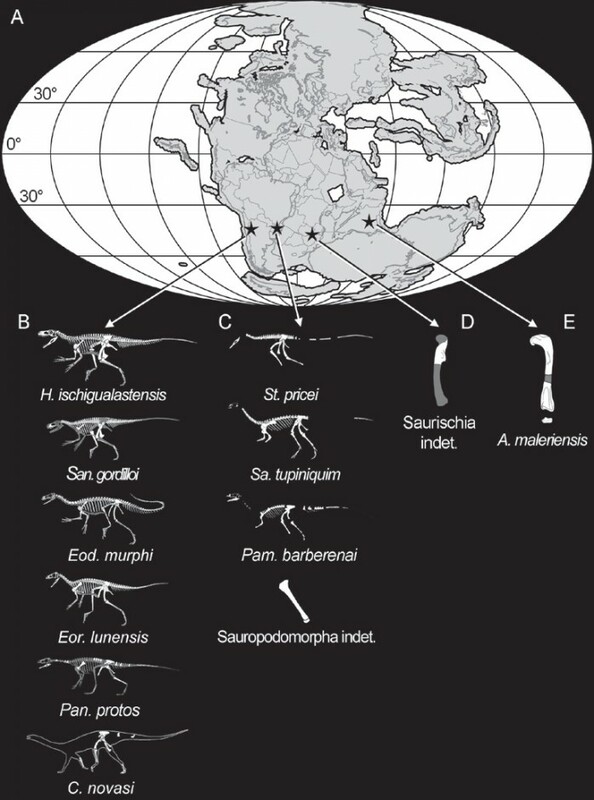 Bringing this back to the idea of the earliest dinosaurs, the idea that we can gain insight into how groups of organisms flourished to become dominant through looking at macroevolutionary patterns is pretty neat! Obviously, early dinosaurs aren’t around today. But by analysing them, we can fill in another part of the puzzle as to how and why groups of organisms fluctuate in diversity through time, replacing, succeeding and dominating each other in the dance of life. Martin Ezcurra is currently a PhD student in Munich working on the early systematics of a group called Archosauriformes. His 25th paper to date (no pressure then) reviewed the taxonomy and palaeobiogeography of these earliest dinosaurs in a macroevolutionary context. He found that in Argentina and Brazil, there are 10 or 11 recognisable species in late Carnian to early Norian deposits, a huge leap from what we knew just a decade ago. Back in the Triassic, these areas formed part of south-western Pangaea, so it is odd that, by contrast, only one or two species can be identified from deposits from the same time, but from south-central Pangaea (now Zimbabwe and India). Ezcurra thinks this may be down to the less intensive sampling of dinosaur-bearing formations in these countries; so Zimbabwe and India, you know what to do! To understand these patterns are controlled, it is necessary to look at other sources of information that can be integrated into macroevolutionary studies. This includes palaeoclimatic data, such as temperature, humidity, atmospheric chemistry, as well as parameters such as altitude and land surface area. The regions where these dinosaurs are found are interpreted to have once been subtropical to cool temperate arid areas. Humidity is actually thought to have been an important driver of these early dinosaurian biogeography patterns, with dinosaurs achieving a cosmopolitan distribution by the latest Triassic. This may be linked to a period of global climate change, such as the end of the “Carnian Pluvial Event”. Intriguingly, no dinosaur remains are known from contemporary formations closer to the equator. In the humid tropical to warm temperate areas of Laurasia (0-30 degrees North), the only known tetrapod fossils are ‘non-dinosaur dinosauriforms’ (palaeontologists know how to make their jobs easier) such as Silesaurus opolensis, Saltopus elginensis, and Diodorus scytobrachion. This dichotomous taxonomic distribution may indicate that climatic variables were largely responsible for the early, but isolated, evolution and diversification of dinosaurs. Note, that if this is the case, as already has been suggested for many other groups, it shows that climate changes don’t always inflict extinction extinction extinction upon organisms, as I think many today seem to believe with the concurrent ‘biodiversity crisis’ and global warming. In fact, a recent paper has demonstrated that tropical species, specifically ectotherms, may in fact benefit from a warming climate by conferring the advantaged of higher maximal development rate. Integrating studies such as this with that of Ezcurra are crucial if we are to gain a sort of reciprocal illumination, of how life got to the stage it’s at, and the biological or environmental conditions responsible for that. I have a question about that: Would you consider that & Steve Kirk’s other restorations as accurate for the time (1996)? I ask b/c I’m reading a book w/several of them, but wasn’t sure. Many thanks in advance. The fossil depictions seem accurate to me. The total environmental restoration will always be a little leap of faith, as the fossil record only preserves scraps that hint at the bigger picture. I don’t know about Steve Kirk’s work, but I’d imagine that anything from 1996 would be considered a bit out of date by palaeo-standards, given the number of findings from the Triassic in recent years!